For people living in Houston, concrete services are all around. From building construction, to never-ending roadwork, we’re a city that’s constantly evolving. While such change can be exciting, it also makes it difficult to get a firm grasp on all that’s going on. T&T Construction can help. Read on for the latest company news, industry updates and useful information, and keep yourself in the know. Hurricane Harvey’s substantial winds and record-breaking rainfall dealt a devastating blow to Texas’ Gulf Coast. Widespread flooding, particularly throughout the Houston metroplex, forced homeowners from houses and business owners from offices — and left many people wondering exactly they were up against. At T&T Construction, we view our team members as more than employees. In our minds, they’re our partners, our biggest asset and the reason we’re able to carry out the work we love. (In fact, it’s written all over the T&T tenets sign inside our office.) We are proud to announce that it appears the feeling is mutual. Do Concrete Sidewalks and Driveways Require Ongoing Care? 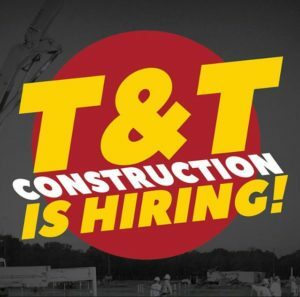 You know who T&T Construction is, and you know what we do. One question remains, however — where do we do it? While we could suffice it to say that our company proudly offers quality construction services throughout the Houston area, we’ll be the first to admit that Houston is a big place. Construction crews are a dedicated bunch. They’re people who enjoy a hard day’s work, relish a job well done and don’t mind digging in to do whatever it takes to make that happen. Still, when Mother Nature throws in seasonal obstacles — namely, her blistering summer heat — it can place companies’ prized personnel in harm’s way. When you think about T&T Construction, what comes to mind? Foundation work? Machine bases? Our volumetric mixers? Any one of those would be a perfectly fine response. In fact, projects like those make up a majority of what we do. But our crew enjoys keeping things interesting. We jump at the chance to tackle out-of-the-box projects — especially those that allow us to get creative or make a difference within the community.